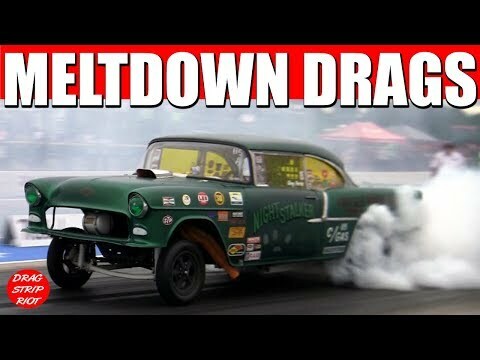 2017 Meltdown Drags Vintage Gasser Drag Race Showdown action from Byron Dragway on Friday featuring a wild day of burnouts and rat rod goodness: Vintage gasser showdown drag : put up or shut up. Greg Porter in his Night Stalker; Randy Stone in his Bootlegger Chevy ;Nick Shervino in his Iron Man 1957 Chevy; Jerry Lopez in the River Rat Chevy; Bone Shaker Willys; the ScottRods AA/Gassers of: Tim Ir in his Crazy Man's Toy Anglia; Brian Spotts in his It's Crazy Anglia; Martin Stead Jr. in his Stead Speed Shop 1941 Willys; Mark Benjamin in his Benjamin - Kasicki - Klink 1933 Willys; Ed Kasicki in his Phenomenon 33 Willys; Mike Kalinowski in his Unfinished Business 1948 Austin; Al Borowski in his ScottRods 1951 Anglia; and Bob Cook in his Crazy Grandpa 1957 Corvette. Drag Strip Riot videos are the number one destination for some of the greatest drag race and amazing pure adrenaline rush, and insane original racing videos and compilations of ordinary people doing awesome and extraordinary things in cars, even best bike on race ever on earth, extreme and other outdoor entertainment activities for men, women, girls and boys, and for family friendly other amazing feats, including hill climb, and a host of other action ; including Top Fuel dragster, Funny Cars, Gassers, Hot Rod Drag Week, Street Outlaws, Nitro Drag Cars, Jr. Fuel, Pro Mod, Nitro Harley, Jet Cars, Drag Racing Crashes, and assorted nostalgia drag racing from NHRA and IHRA, as well as stick shift on asphalt. Whether you’re searching in 2018 or any other year, check out our amazing and original action videos in HD where we show you the crazy and unbelievable! Better than playing Fortnite online game or going to the drive in movie theater.